She returned after a while and the portions were shot again. The shots showing Katrina breaking down were edited out. Even Salman mellowed down after that and tried his best to make her laugh. Salman Khan embarasses Katrina by asking about the decending age of her co-stars. After working with seasoned costars like Akshay Kumar and himself, she is now working with younger actors like Ranbir Kapoor. He pokes by being funny “Aur kitna neeche jaane ka irada hai madam”. Katrina looks away and later says that she could even do a children’s film. Clearly, the Katrina’s treatment was different from what Pamela Anderson got. 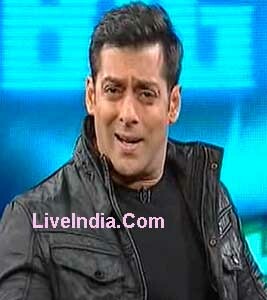 We are talking about the lack of knowledge of Hindi and Salman’s handling of the fact. Katrina Kaif says that Akshay Kumar is better than Salman Khan as a co-star. Farha Khan enters the Big Boss house. She tells Veena Malik that she looks beautiful, even better without makeup. Farha is very impressed with Veena’s “sheila ki Jawani” dance. Dolly Bindra takes the cake. For her size, she does very good moves. Farha tells Salman that he and Katrina make a good pair. But, Katrina’s body language meant that she was just putting up with Salman.